Since our inception in 1995, Theater Three Collaborative, Inc. has been creating, developing and producing poetic, character-driven plays on crucial topics of the day. TTC was founded by the late Lee Nagrin, George Bartenieff and Karen Malpede to produce The Beekeeper's Daughter. We also create and host Festivals of Conscience, talks and talkbacks with public intellectuals, activists and specialists in the field of the play. Plays in Time has 3 "5 star" reviews on Amazon. George Bartenieff, co-founder, producer/director/actor, began his theater career at the age of 14, in The Whole World Over, directed by Harold Clurman. He has acted on Broadway, off and off-off, in hundreds of new and classic plays. He was co-founder of Theater for the New City, and co-founder of the Greenwich Village Halloween Parade. His work in new theater includes major roles with: The Living Theatre, Judson Memorial Poets' Theater, Bread and Puppet, Mabou Mines, Andre Gregory's Theater for the Living Arts; he starred in plays by Edward Albee and Samuel Beckett. He and Malpede adapted for the stage the diaries of Victor Klemperer, I Will Bear Witness, as a one-person play that played to acclaim in New York, London, Berlin, Washington DC and toured Europe and the U.S. for three years. He is winner of four Village Voice Obie awards, including for Outstanding Contribution as an Actor, for acting in "I Will Bear Witness" and producing. He is a graduate of RADA and The Guild Hall, London. "Encomiums, hosannas and tributes, plus criticisms and analyses, should be written about actor George Bartenieff even more than they already are. His sheer longevity is breathtaking, having debuted on Broadway in 1947 at age 14 never slowing down since. Pick virtually any period of his career, it seems, and one element remains the same: Bartenieff has pursued a mix of passion projects that intermingle a belief in social justice with an unflagging fidelity to craft." Karen Malpede, Hermes and Cleis. Karen Malpede (Co-Founder, Writer/director) author/director of 19 plays, two of which are currently in development: Other Than We and Blue Valiant, to star Kathleen Chalfant. Recent: Dinner During Yemen, part of “Imagine: Yemen” at The Irene Diamond Signature Theater, 2018, publication Kenyon Review, Oct, 2018; Extreme Whether, LaMama, 2018, Paris ARTCOP21, 2015, Theater for the New City, 2014; The Beekeeper’s Daughter, Theater for the New City, 2016 (revival), premiered 1995 at the Festival of World Drama, Veroli, Italy. “One of America’s most prominent political playwrights,” Marvin Carlson. Her seven books include Plays in Time: The Beekeeper’s Daughter, Prophecy, Another Life, Extreme Whether (Intellect, 2017), editor: Acts of War: Iraq & Afghanistan in Seven Plays (Northwestern, 2011), A Monster Has Stolen the Sun and Other Plays (Marlboro, 1987), editor: Women in Theater: Compassion & Hope (Drama Book, 1984). She is a frequent contributor to The Kenyon Review; short fiction and essays on theater, ecology and literature are published in TriQuarterly, Confrontations, The Drama Review, New Theatre Quarterly, New York Times, anthologies. McKnight National Playwrights Fellowship, Ludwig Vogelstein and NYFA (then, CAPS) playwriting awards. She is adjunct Associate Professor of Theater Arts and Environmental Justice at John Jay College, CUNY. MFA, Columbia. Lee Nagrin and George Bartenieff in a scene from Blue Heaven. 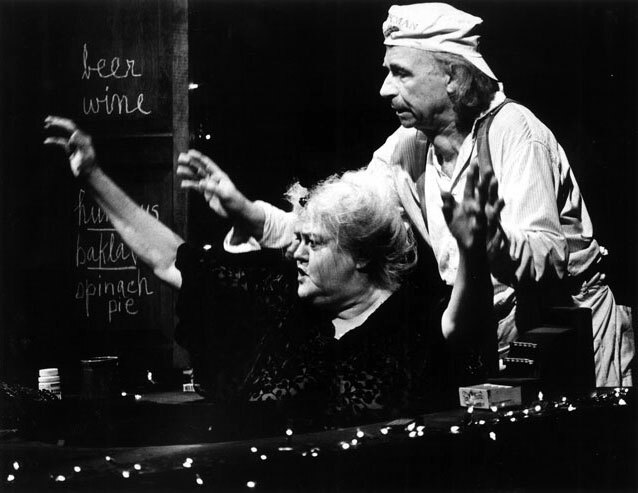 Lee Nagrin was a mulitiple Obie and Bessie award-winning choreographer, writer, actor, and theater creator. Each member of the Theater Three Collaborative artistic team is a renowned artist in her/his own field. Tony Giovannetti, lighting design; Luba Lukova, graphics and video design; Sally Ann Parsons, costumes, Arthur Rosen, sound and original music, Robert Eggers, set design Another Life ; Maxine Willi Klein, set design Prophecy & The Beekeeper's Daughter, Beatriz Schiller, photos Another Life; and Ari Mintz, photos, Prophecy. Join our email list for news of events, publications and future productions. We depend upon audience donations, which are tax-deductible. Theater Three Collaborative creates, develops and produces new poetic-language, character-driven plays on pressing social issues. We surround our plays with Festivals of Conscience, talks and talkbacks by experts in the field the plays addresses.